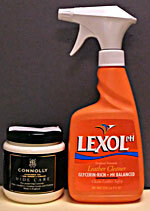 Buy the two greatest names in leather conditioning: Connolly Hide Care and Lexol Leather Cleaner. 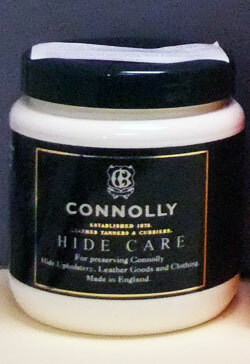 Since the day the hides in your car were installed they have been losing their essential oils, Connolly Hide Care is your best chance to replace them and give them back that new car aroma. UPDATE: WE ARE COMPLETELY SOLD OUT OF HIDE CARE. For Lexol, click here.